I decided to have a sort out of my baking cupboard this morning and found several half opened packets of bits and pieces including dates and walnuts. The obvious thing to make would have been a date and walnut loaf, but since I only made that very tempting peanut butter cake yesterday we so don’t need anymore cake in the house! So I decided to try some scones and here is the result. They turned out pretty good – the dates add a lovely toffee like chew against the crunch of the walnuts. Sieve the flour and salt (if using) into a bowl. Stir in the brown sugar, dates and walnuts. Pour in the milk and mix to a soft dough. I'm always cautious of overmixing when making scones so I use my hands and stop mixing as soon as the mixture comes together. Then I tip the mixture out on to a floured work surface and lightly fold the dough over on itself a few times until smooth. Pat out into a round, about 1 inch thick. Using your cutter, cut into rounds. Don't twist the cutter while you are cutting out the scones or they will be wonky! Place on a baking sheet and bake for 10-15 minutes. By that time they should be well risen, golden and smelling lovely! I love it when I find a recipe that I have all the ingredients for, yours is one of them. 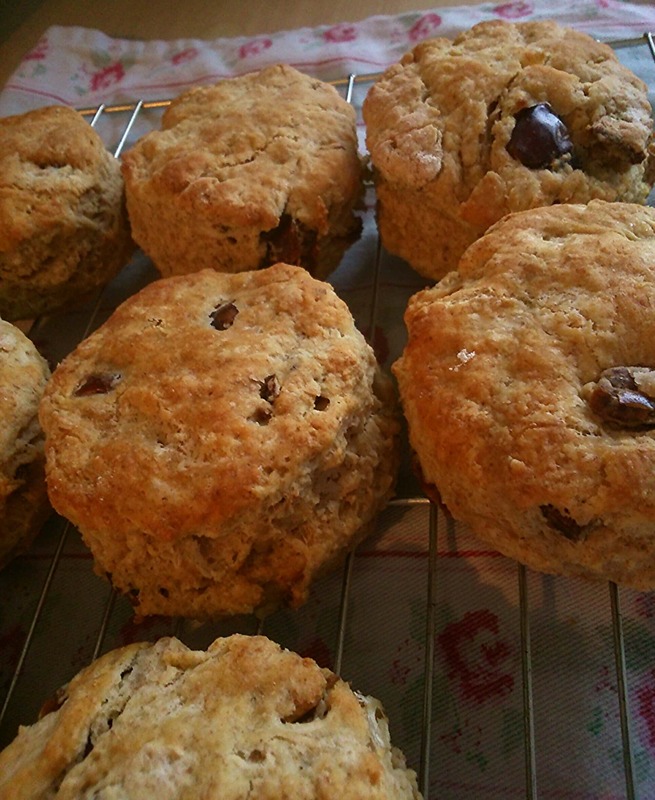 The scones look and sound delicious, I think I’ll have to try these out. Scones – one of my favorite breakfast foods. These look lovely and very appetizing. Yum! Love the last photo – it looks like one’s already been snaffled! First time here.. love it.. will be going through your whole blog.. Absolutely 😉 And nuts are healthy too, they really are health food!